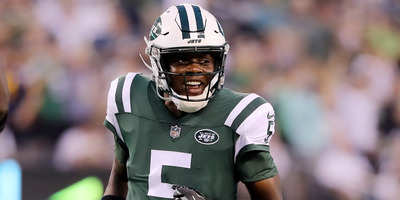 Elsa/Getty ImagesTeddy Bridgewater, Josh McCown and Sam Darnold all have a case to be named the starting quarterback in New York, leaving the Jets with a good, but difficult problem. While Bridgewater might be in the best form of any of the three right now, it might be in the Jets’ best interest to trade him away, as any value in trade could help the Jets in the long run. Halfway through the 2018 NFL preseason, the New York Jets are faced with a good, but challenging, problem – they have too much talent at quarterback. Right now incumbent starter Josh McCown, rookie standout Sam Darnold, and phoenix-rising Teddy Bridgewater all have a case to be named the team’s starter in 2018, and after two preseason games, the Jets don’t appear to be any closer to an answer. Darnold, the third pick overall in the 2018 NFL Draft, has been impressive thus far in training camp and preseason play. The Jets paid a king’s ransom to move into position to draft the USC standout and there’s no doubt that Darnold will soon enough be the team’s franchise guy. But for a team not expected to compete in 2018, it might not be worth it to trot out a rookie to get torn to shreds. While other teams have had success starting rookies right out of the gate in recent years, for the Jets, it might be tempting fate. And then there is Teddy Bridgewater. After starting for the Vikings for two years, including leading Minnesota’s 2015 campaign to an 11-5 record and a postseason appearance, Bridgewater suffered a career-altering injury that took him off the team’s active roster for 15 months. By the time he was healthy again, Case Keenum had already gotten the Vikings off to a 6-2 start, leaving Bridgewater on the sidelines aside from a brief relief appearance in Week 15 that served as an inspiring curtain call in Minnesota. Since little was known of how complete a return he’d be able to make, the Jets were able to bring in Bridgewater during the offseason on a low stakes, affordable deal– one-year, $US6 million, with just $US500,000 guaranteed – and so far, it looks as though their investment could pay dividends. While Bridgewater was brought into camp on a flyer, through two solid preseason games, the 25-year-old looks like he hasn’t lost a step, and there’s an argument to be made that he’s in the best current form of any quarterback on the Jets roster. That thinking might go against traditional football thought – most of the time, teams are looking to start their best quarterback – but the Jets are in something of a perfect storm that makes it the right move. With only 53 slots, keeping three quarterbacks on the active active roster is a stretch for most teams, and since there’s no chance of the Jets trading away Darnold, that leaves McCown and Bridgewater as the potential names on the trading block. There are indeed teams that wouldn’t mind adding McCown’s veteran presence to the locker room but should the Jets be able to move Bridgewater they would likely receive a bigger haul in return. Whether in the form of strength at another position or future draft picks, that increased value of return is plenty of incentive for the Jets to part with Bridgewater, even if he might be the best quarterback on their roster at the moment. As for teams that would be interested in Bridgewater, there’s a few that fit the bill. The Buccaneers, should they wish to move on from Jameis Winston after his latest infraction, could make a move for him. The Eagles may also be in play, with backup-turned-Super-Bowl-MVP Nick Foles getting injured in the preseason and Carson Wentz’s status for opening day still unclear. Additionally, any team with Super Bowl aspirations and a below-average backup would undoubtedly be in the market, such as the Rams or Jaguars. It’s likely the Jets won’t decide on this front until all four preseason games are played. But if Darnold continues to play like he’s ready to be the starter, there’s little reason for the Jets to keep both of their other two guys around as backups, and moving Bridgewater could wind up giving the team a huge return on its investment.